In the Microsoft 365 compliance center, you can easily access solutions to help you assess your compliance risk through Compliance Manager, protect data through features like Data Governance, and respond to regulatory obligations like Data Subject Requests. Along with the new Microsoft 365 security center, these specialized workspaces are designed for security and compliance professionals to centrally manage Microsoft 365 services with a unified experience and insights powered by artificial intelligence (AI). 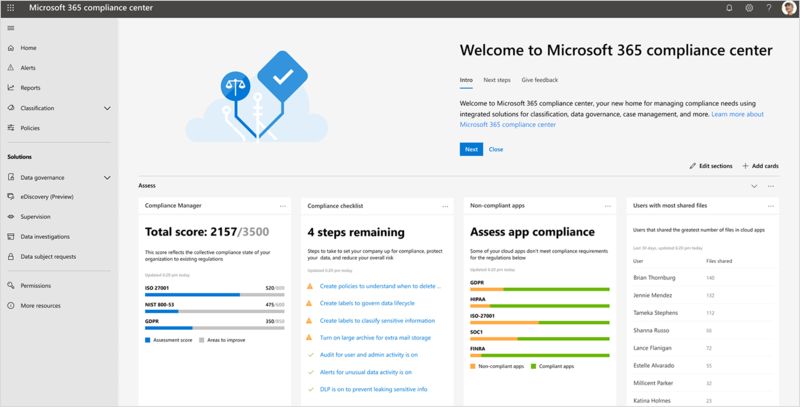 Microsoft 365 compliance center shows actionable insights to help improve your GDPR and ISO compliance. We’ll gradually roll out the new experience starting today. Read the Tech Community blog to learn more. To help protect sensitive data consistently across various platforms, we’re announcing new Microsoft Information Protection capabilities that enable users to classify content and apply labels to documents and emails directly from Office apps on Mac (Word, PowerPoint, Excel, and Outlook) and Office mobile apps (Word, PowerPoint, and Excel on iOS and Android). For example, a user working on a Mac can assign a “Highly Confidential” label while working on an important Word document. This results in the application of the appropriate protection policy, such as adding encryption and access restrictions or adding visual markings. Learn more about new labeling capabilities in Office apps that help you protect sensitive information. Classify content and apply labels to add encryption, access restrictions, or visual markings to documents and emails directly from Office apps on Mac, iOS, and Android. We’re also releasing expanded label analytics capabilities that enable customers to analyze and validate how sensitivity and retention labels are being used across both Office 365 data and non-Office 365 data. The new label analytics capabilities in the Microsoft 365 compliance center are currently in preview. View Office 365 and non-Office 365 data classification and policies together from the new label analytics dashboard in the Microsoft 365 compliance center. Other enhancements in Advanced Data Governance include the file plan manager, which helps customers migrate governance policy configurations. With the file plan manager, you can map complex retention schedules from your existing records management solution or on-premises repository into Office 365. Read more about all these new updates in Advanced Data Governance. During litigation- and investigation-related tasks and workflows, keeping more content in place can help reduce costs and risks associated with handling sensitive data. New capabilities in Advanced eDiscovery can help you communicate with custodians (for example: employees related to a case or investigation), isolate case-related contents for processing within a static set, and use the new review and redact capability to modify sensitive portions of documents before exporting them as part of a legal matter. Watch our video and read more about these updates to Advanced eDiscovery. Regulated industries, such as financial services, need the ability to monitor and audit communications for specific roles in their organization. 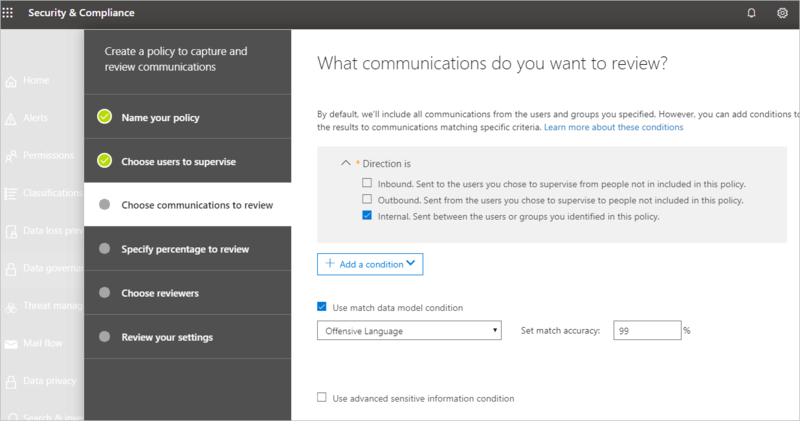 Now, Supervision includes Microsoft Teams content and additional capabilities to flag sensitive data types and offensive language classifiers. Learn more about these updates in the Tech Community blog. Monitor Teams content in the new integrated supervisory review experience. To help regulated customers meet specific immutability and retention requirements, we’re also announcing the availability of a new SEC 17a-4 regulation compliance assessment completed by Cohasset for Exchange-based storage, including email, groups, chats, and other communication types. Learn more about updates to Advanced Data Governance in the Tech Community blog. Privacy and compliance are deeply ingrained in the culture at Microsoft and embedded in the practices that are at the core of how we build and deliver our products and services. Watch Microsoft executive leadership and a leading privacy analyst from Forrester Research share their insights on how organizations are investing in privacy as a differentiator with their customers. Read our online e-book on how Microsoft runs on trust. 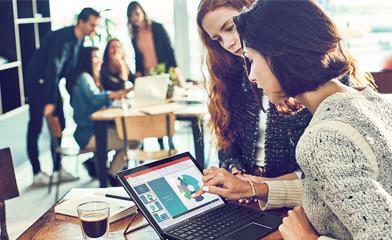 Learn more about the new Information Protection and Compliance offering in Microsoft 365 today.